When it comes to pastor anniversary ideas remember that it's the personal touches that really make an event special. The ideas on this page are just general suggestions. Take them and adapt them to your church and your pastor's personality. Of all the pastor anniversary ideas I've seen, hosting an event is probably the most popular with churches. You can have a banquet in honor of your pastor. Or you could plan a roast - a humorous way to show your pastor appreciation. You might even want to set aside a special worship service to encourage your pastor with a pastor's anniversary celebration. If you want to plan a banquet, you might want to adapt the following schedule. Have music playing in the background to set the mood and make people feel comfortable. After everyone is seated, use a table ice breaker to help people get comfortable. Play a DVD presentation - It could be an overview of last year's ministries or it could be a humorous look at your pastor. Sing a special pastor appreciation song. Have someone give a pastor's anniversary speech as a tribute to your pastor. Perform a pastor appreciation skit . Present your pastor a gift . Allow your pastor to respond and to paint a picture of next year's ministry emphasis. Close with a song of commitment. Start your service as is appropriate for your church. Sing a song about God's faithfulness. Play a DVD presentation showing a collage of people giving short answers to the question, "What do you appreciate about your pastor?" Have someone make a speech or give a sermon. Use a pastor appreciation skit. Present your pastor a gift . Give your pastor an opportunity to respond and to envision next year's ministry. Have someone lead the congregation in a prayer of commitment. Close the service with a song of commitment. My Pastor Appreciation Workbook gives you nearly everything you need for your Pastor's Anniversary celebration. It includes ideas, a sermon, a children's sermon, planning help, and much more. Learn more here. Use these pastor anniversary ideas to start a brainstorming session. Present your pastor a photo album with pictures of last years highlights and events. This might be the perfect time to give your pastor a sabbatical. Make a photo album with individual pictures of church families. Have each family write a brief message to the pastor and print the message on the photo album page with their picture. "Kids say the darndest things." Make a DVD with interviews of the children in your church. Ask questions like, "What does your pastor do?" "What do you like about your pastor?" Find out who your pastor's mentor is (either from seminary, his internship program, or elsewhere). Invite the mentor to visit the church and speak...pay him/her an honorarium and travel expense. Invite the pastor's family and/or his wife's family to come for the celebration. Help with expenses if the distance is significant. During a regular service, have a few people prepared in advance to share their thoughts on your pastor. Lease a billboard along a nearby highway. Use the sign to honor your pastor and invite people to your church. If it's appropriate, invite the local Mayor or State Representative to attend a service and speak briefly about your pastor. Assign each Sunday School class to create a project (art, skit, DVD, song, etc.) that honors your pastor. Plant a tree for each year he has been your pastor. Follow these simple steps to design a much-appreciated anniversary event. 1) Get together with a few other people and use the ideas listed above as a starting point. 2) Then generate a long list of ideas...don't rule anything out at first. 3) When your list is complete, pick a theme for your event. 4) Then go back through your list of ideas and choose the ones that best fit with your theme. 5) Give each person a responsibility to accomplish and a time limit for when it should be completed. Your pastor's anniversary is the perfect time for a celebration. You can use it for a simple party. Or, you can develop it into a time of rejoicing in the past, assessing the present, and planning for the future. However you do it, use these pastor anniversary ideas to spark your creativity so that you plan an event that's unique to your church and your pastor. 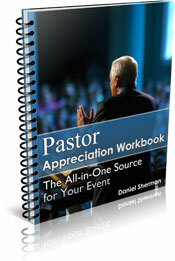 For more help with pastor anniversary ideas, try my Pastor Appreciation Workbook.